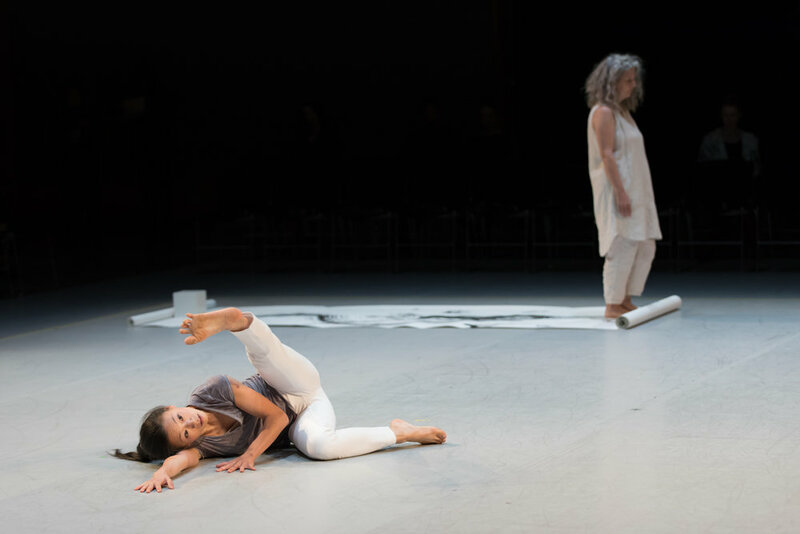 2016 Bridge Project: Ten Artists Respond to Locus, was a multidisciplinary exchange with dance history inspired by the work of dance pioneer Trisha Brown. In partnership with local curators, HMD commissioned a diverse group of ten artists to learn Brown’s iconic dance Locus and create new works in response. HMD presented the ten premieres, along with a performance by local dancers of Locus itself, in the YBCA Forum Friday October 14 & Saturday, October 15, 2016. Locus Solo. Choreography by Trisha Brown (1975). Direction by Diane Madden. Performed by Hope Mohr. This reconstruction was nominated for an Isadora Duncan Dance Award ("Izzie") for Best Reconstruction. It transmits [Brown’s] work in its purest and most direct form, from body to body; and it shifts the work from being a purely historic entity towards an immersive experience of the mind of a tirelessly inventive artist. It takes the work off the shelf, and gives it new life in contemporary minds.. . . We are inspired by the ingenuity of Hope Mohr Dance, and we look forward to fully realizing this collaboration. The Locus project coincided with the historic transition of the Trisha Brown Dance Company’s out of their farewell tour and into preservation of Brown’s legacy. The program also provided an opportunity to pay homage to Mohr’s roots (Mohr is a former TBDC company member). The Locus project began with a workshop open to the public in which Diane Madden, TBDC’s Co-Artistic Director and Brown’s longtime muse, teaches Locus. Madden will select four participants from the workshop to perform the dance in YBCA’s Forum October 14-16 (alongside the premieres from the project’s ten commissioned artists). A free public talk about the work of Trisha Brown. Wednesday September 14th at 1 PM at the Joe Goode Annex. Trisha Brown’s experiments with space, gravity and the orientation of the body have challenged the way we define performance for over fifty years. Her 1975 solo Locus bridges past and present choreographic thinking and bridges dance and other disciplines. The score for Locus is “the most important of Brown’s [early] works” and “connects her choreographic work to concurrent visual arts practices.” (Walker Art Center) To make Locus, Brown designed an imaginary cube for each performer with points corresponding to the alphabet. Dancer gestures spelled out sentences from an autobiographical statement written by Brown; from there, performers spilled into improvisation. Key elements of Locus’ score remain relevant to artists today: cross-media experimentation with linguistics; the relationship of structure to content; and the integration of artist and environment. Locus is a multidisciplinary platform for discussions about the progression of artmaking over the past forty years. Visual score of Trisha Brown's Locus. Peter Eleey, “If You Couldn’t See Me: The Drawings of Trisha Brown,” Originally published in Trisha Brown: So that the Audience Does Not Know Whether I have Stopped Dancing, exh. cat. (Minneapolis: Walker Art Center, 2008). Mona Sulzman, “Choice/Form in Trisha Brown's ‘Locus’: A View from inside the Cube, Dance Chronicle, Vol. 2, No. 2 (1978). "The Bridge Project: Ten Artists Respond to Locus" was a solid program of smart variations and inspirations showcasing some of the Bay Area's most inventive artists and performers." 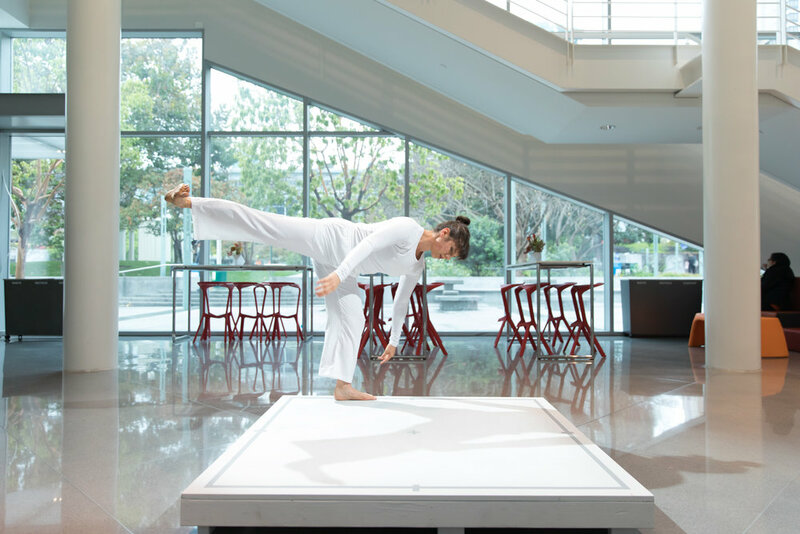 Choreographic Transmission in an Expanded Field: Reflections on "Ten Artists Respond to Trisha Brown's Locus"
Photo of Trisha Brown by Lois Greenfield. All rights reserved. All other photos on this page by Margo Moritz. Ten Artists Respond to Locus was made possible in part through support from the National Endowment for the Arts, Zellerbach Family Foundation, William & Flora Hewlett Foundation, Kenneth Rainin Foundation, San Francisco’s Grants for the Arts, the San Francisco Arts Commission, and the Sakana Foundation. Participants in the 2017 Bridge Project at the end of Ten Artists Respond to Locus.